Over the next few weeks there are lots of reasons to walk more! To tie in with National Walking Month, led by Living Streets, we’re celebrating walking in a big way this month across Hertfordshire. Walking is one of the easiest ways most of us can become a little bit more active – whether that’s aiming to increase your daily steps gradually, walking to work or to school, or exploring your local countryside. Keep up to date with Walking Month activity via #HertsYOPA18 Facebook and Twitter. Scroll down for some key dates for your diary! Love walking? Share your passion with others! Call 01992 588433 or email healthwalks.cms@hertfordshire.gov.uk with your preferred course date. 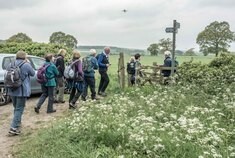 Every year to celebrate National Walking Month the Hertfordshire Health Walks team organises a Mass Health Walk, to get as many people out walking across Hertfordshire in the same day. This year the event will take place on Monday May 14th and over 25 walks are available to join. Follow Health Walks on Facebook to find the full listing of walks, find a walk to suit you, then tell all your friends! 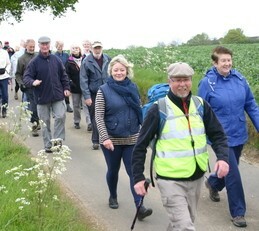 Help us to become the biggest walking group in Hertfordshire! The variety of activities on our Walks & More calendar during Walking Month means there's something for everyone to enjoy. These FREE outdoor events are a great opportunity to enjoy exploring Hertfordshire's beautiful countryside, learn local history, or have a fun family day out. Below are some of our top picks. Join CMS and the Oxhey Woods Conservation Volunteers for a 2 ½ mile circular walk through this diverse site, much of which is ancient woodland. We will take in the bluebells and other spring wildflowers, and learn more about past, future and current management of the site. Meet at Oxhey Woods Sculpture Trail car park, located off Woodside Walk (Oxhey Drive South)/Prestwick Road. Nearest postcode: HA6 3EX. Just turn up - no booking required. Celebrating 20 Years of Walking Buses - could you volunteer? Help Hertfordshire's children get more active! The Walking Bus is a scheme encouraging volunteers to walk children to school along a set route. The children walk in pairs and everyone wears high visibility clothing. With a “driver” at the front and a “conductor” at the back, the children are collected at “bus stops” at agreed times along the route. This would be a great opportunity to support our young people to become more active every day. If you would like to find out more about volunteering for the walking bus please contact activeandsafertravel@hertfordshire.gov.uk. 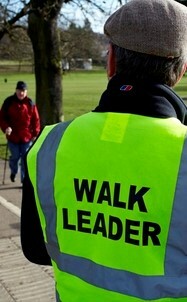 We love to hear your comments and see your pictures of the walking events you take part in. Please email healthwalks.cms@hertfordshire.gov.uk. This is a monthly email, but if you’d prefer not to receive it you can unsubscribe below.